If you’re looking for an easy Thanksgiving side dish, I’ve got you covered with these Roasted Carrots with Carrot Top Pesto. I especially love this recipe, because it uses the entire carrot, end to end, including the tops, which so often get throw away. 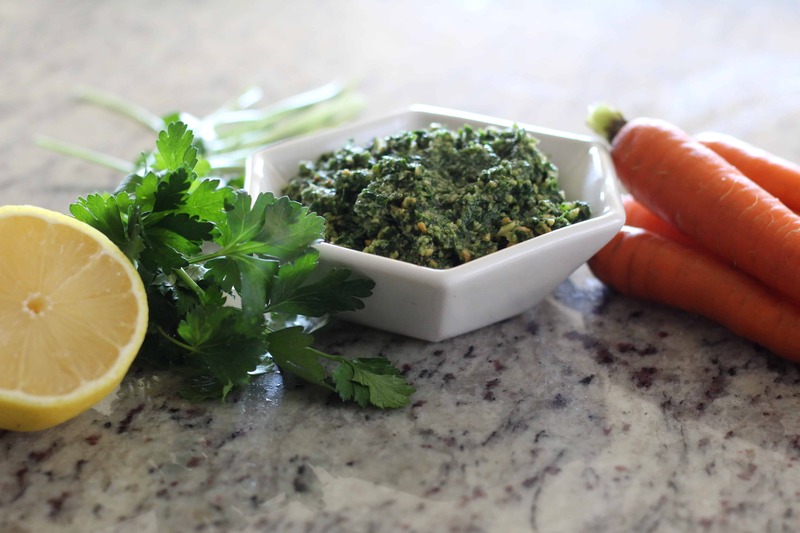 I first had carrot top pesto, 3 years ago, while at a dinner hosted by my friend, Lena, in her home in Portland, OR. It was a delicious condiment and I have been replicating it ever since. For this recipe, I roasted the carrots on a sheet tray in the oven, but you can saute them in cast iron skillet on your stove top, if you’re oven is busy cooking your turkey. In a food processor, combine carrot tops, almonds, lemon zest, garlic, salt and parsley. Pulse a few times. While blending on low speed, drizzle in the olive oil in a slow drizzle. Continue blending until mixture comes together. Taste and adjust seasoning if needed. Trim tops of carrots and wash with cold water. To remove dirt from the very top of the carrots, place top down in cold water. If carrots are wider than 1 inch in diameter, slice in half. Dry carrots completely. Toss carrots in olive oil and honey. Season with salt and freshly ground black pepper. 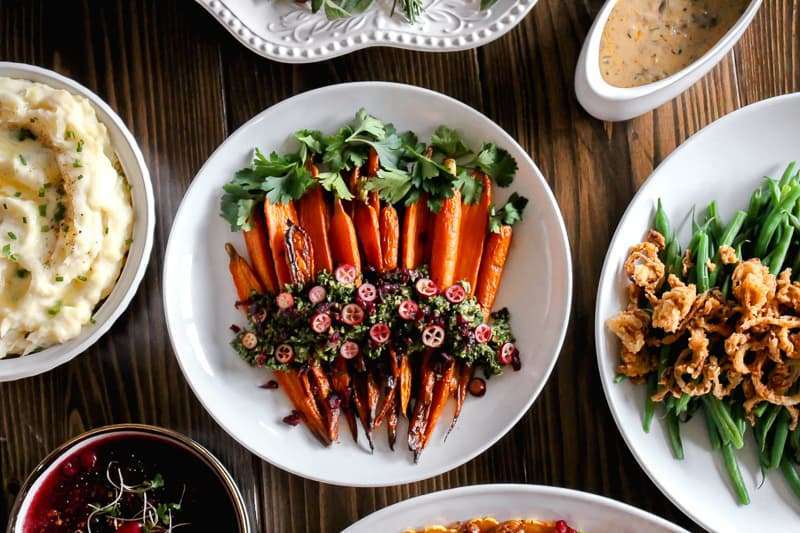 Place carrots in a single layer on a sheet pan. Roast in the oven for about 20 minutes, until caramelized and tender. Top with pesto, and garnish with flat leaf parsley and cranberries.